Most medical providers are honest and work hard to improve their patients' health. However, a few want to illegally increase the size of their bank accounts. Learn some of the basic health care provider schemes and how to deter them from taking some easy money. Patients with Alzheimer's disease were sitting unsupervised inside a small room of a medical psychological care facility watching the movie "Forrest Gump" for the umpteenth time. Granted, it's a great movie, but each time the patients sat in front of the tube watching it, the facility submitted insurance claims for providing "group therapy." I discovered this fraud during my investigation of the facility. It's just one of a long list of crimes committed by a handful of crooked medical providers. The difference between the health care realm and many other industries is its huge, alluring, easy pile of cash. According to the Centers for Medicare & Medicaid Services (CMS), national health expenditures in the U.S. reached $2.6 trillion in 2010 — 17.9 percent of GDP. The CMS projects U.S. health spending to rise to 7.4 percent in 2014 as a result of the major coverage expansions from the U.S. Affordable Care Act (ACA) — an estimated 22 million people will be insured. Over the period of 2015-2021, health spending is projected to grow at an average rate of 6.2 percent annually. Over the years, I've found investigating fraud committed by health care providers, facilities and institutions to be extremely fascinating, challenging and rewarding. Most associate those individuals and entities with only doing good and helping others. Although that's true of most health care providers and institutions, others do "go south." 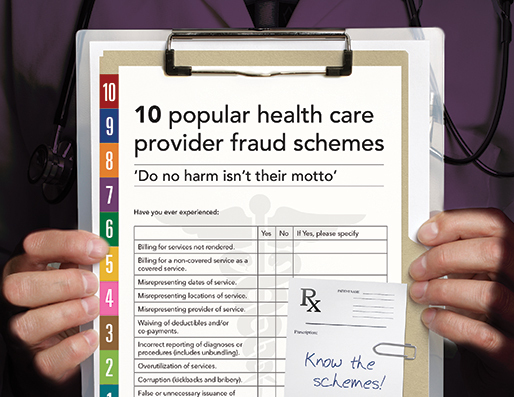 In this article, I describe 10 of the common health provider fraud schemes I've found, and I include some cases I've investigated. This list definitely isn't inclusive, but it will get you started on understanding how providers can be tempted to defraud a lumbering system. In almost every health care fraud examination I've conducted, I've found evidence that the medical provider or its facility submitted claim forms to government health care plans and/or insurance companies for services and care — that were never provided — and the corresponding patient files had no supporting documentation. It makes sense that if a fraudster would commit any of the other schemes listed above, which takes a bit of brainpower and effort, they might as well throw in some extra dates and codes on the claim forms to try to make some real easy money. During the early stages of a health care fraud examination or investigation, I identify the reported dates of service listed on the claim forms and then look for any documentary evidence that the patients were at the facility on those dates. I first check a patient's medical file. If a staff member had seen the patient, obviously somebody should have written something down — even if it was just documenting the patient's height and/or weight. If I find no documentation, I check the facility's sign-in logs. If there's nothing there, I check the appointment calendars. Of course, you try to be fair and objective. Our ability to empathize with others (including suspects) helps us treat them fairly and allows us to better understand their situations. So, I realize that records can be misplaced, and, occasionally, somebody might forget to write something down. However, a pattern of billing for services and care with no supporting documentation is unacceptable and unlikely to be coincidental. Healthcare providers' excuses for missing documentation are sometimes almost humorous. Some providers have blamed non-existing floods, fires and even Y2K (remember the "Year 2000 Problem" or the "Millennium Bug"?) for missing documents. I keep waiting for someone to tell me his dog ate the documentation. Documents alone don't usually prove intentional wrongdoing. Fraud examiners and investigators also will need to locate witnesses who can — and are willing to — truthfully relate what they know about the fraud. That's when well-planned interviews come into play. Often interviewing the patients whose names are listed on the questionable claim forms can clear things up. They know whether they visited the doctor or not, and — unless they were unconscious when providers examined them — they'll have a pretty good idea what services they received. However, sometimes patients have foggy memories or medical issues that impair their memories of past visits. And the claims might be several years old. In Medicare investigations, an added dilemma is that the elderly patients sometimes die before they're interviewed or before the cases go to trial. Most people in the medical field are honest and ethical, so fraud usually will bother their consciences. Sometimes they'll just quit their jobs because they don't want to be part of illegal activities. But for those who remain on the job, they often won't tell what they know until they're confronted. I've found it's usually best to interview employees and former employees of medical facilities at their homes or at least away from the facilities. Make sure you leave your business card with them, even if they don't want to talk (yet). Billings for services and care not rendered often make for simple cases to present in court because the scheme is so basic that even half-asleep jurors can understand it. Even when I'm putting together a health care fraud case that also includes more complex fraud schemes, if I find evidence of billing for services with no supporting documentation, I often include those first in my summary report. During one fraud examination I conducted, an allergy doctor was providing a treatment, which was considered experimental and therefore not approved by government health care plans or other insurance companies. With a few strokes of a pen or taps on a keyboard, the allergy doctor submitted claim forms and still got paid for utilizing the experimental treatment. She accomplished this by calling it (and coding it) something else that was covered by insurance plans and policies. Like most other criminals, this doctor rationalized her wrongful actions. She believed she was providing a useful service to her allergy-suffering patients and that it wasn't her fault the government and insurance companies hadn't yet approved the experimental treatment. Keep in mind that most patients are only concerned with two things: getting healthy (or finding relief from their suffering) and how much they personally have to pay out of their own pockets for medical services. Because the insurance companies are footing the bills (or most of them), patients usually have no qualms as long as they are regaining their health. In the allergy clinic case, the doctor only gave a few patients the experimental treatment; most received approved care. But I noticed something unusual when I reviewed the patients' files: The insurance claim forms showed that many patients were treated at the allergy clinic four or five days per week (Monday through Friday). I remember thinking, "I wouldn't come here that often even if they were giving away free lunches." However, when I interviewed some of the allergy doctor's patients at their homes, they told me they only received injections twice a week. Obviously, my case was getting stronger. Providers might make more money by reporting they visited with or and treated the same patient on two separate days rather than one day. Each "office visit" is usually considered a separate billable service. Often the services the fraudsters list on claim forms are actually provided, but the dates are false because it's more profitable for the providers. So check to assure that the patients' medical file documentation matches the dates of service listed on the claim forms. Focus on the "date of service" not the date the claim form was signed or submitted because those dates may be several days after the service was provided. Let's get back to that allergy clinic. When I interviewed patients at their homes, many who previously told me they only received injections twice a week, also told me they only went to the allergy clinic once a month. The patients said that the allergy clinic workers would hand each of them a bunch of syringes filled with antigens and tell them to inject themselves in their homes! Because I'm a bit shy of needles, and the thought of injecting myself makes me cringe, I wondered if insurance companies would knowingly approve self-injections away from the allergy clinic. A specialist from one of the insurance companies told me that it (and most other companies) didn't accept self-injection as a reimbursable expense. The specialist said medical providers should monitor patients for several minutes after injections to ensure the patients don't have adverse reactions. I examined the claim forms and found that the allergy doctor had reported that the injections were given at the allergy clinic. I started to wonder if the allergy clinic was doing anything legally. I confronted the allergy doctor with the evidence, and she claimed she didn't know this type of billing was improper. I asked how she determined the day of the week the patients injected themselves when preparing the claim forms, and the doctor said that she just guessed. I thought it was more than a coincidence that she always "guessed" the injections were given Monday through Friday (when the allergy clinic was open for business) and not Saturday, Sunday or holidays (when the allergy clinic was closed). I think she knew that billing for Sunday injections would have raised red flags at the insurance companies. In other cases, I investigated physicians who had billed for services provided in their offices that were located in the U.S. while the physicians were actually on overseas vacations. These were closer to "no supporting documentation" fraud, but because the physicians didn't take their patients with them on their trips, those claims were really far off! It's a scary thought that somebody might impersonate a physician and bill for treatment, but it does happen. I've conducted numerous investigations in which medical doctors signed insurance claim forms showing that they had provided all the care but in reality, lesser-educated mental health professionals actually conducted the therapy. In these cases, the affected insurance companies would still have paid for the care provided by the lesser-educated therapists (as long as they were licensed), but they would have paid less. For example, I learned that licensed clinical social workers are often reimbursed less than physicians. In another investigation, I discovered that a psychological care facility even hired people to be therapists who had never been trained to provide those services. One of those unlicensed providers told me he was hired solely because he was a friend of the owner. The facility also had hired a part-time doctor to come in the office two days a week to review treatment files and sign claim forms. During an interview, I asked the doctor why he had signed the claim forms when he didn't personally provide the treatment. The doctor was almost defiant when he said he was permitted to do so because he was the supervising physician. I next asked him if he knew that some of the therapists weren't licensed to provide therapy. The doctor shook his head and asked me, "Well then, why the heck are they working here!?" The doctor said he assumed the owner checked the therapists' credentials before hiring them. He also said he didn't realize that the insurance companies paid more just because a physician signed the claim forms. The doctor also admitted that he normally wasn't on the premises when the lesser-educated "therapists" provided the care, but he rationalized signing the claim forms because he reviewed the patient files before signing. The doctor sadly looked at me and said, "I guess I'm the goat." I replied, "Not if you testify." I looked forward to interviewing the owner; however, he didn't offer any valid excuses for his crimes. He did say he didn't think he should go to jail because he was extremely overweight. Obviously, patients seldom complain when their out-of pocket expenses are low or non-existent. Most government health care plans and insurance companies don't allow medical providers or facilities to waive patients' deductibles or co-payments. The rationale may be that if patients have to pay something to see doctors, they'll only seek care if they really need it. Perhaps it's also a way to offset some of the expenses. Regardless, some providers do waive patients' deductibles or co-payments and then submit other false claims to insurance companies to make up the dollar difference. Truly unscrupulous providers also will add a bunch of other false services to the claim forms to increase their illegal gains knowing that the patients are unlikely to complain because their co-payments and deductibles were waived. When I've interviewed providers who waive co-payments and/or deductibles, they often rationalize their false claims submissions by saying that they don't make any extra profit by doing this; they're just helping out their patients who can't afford to pay their medical bills. However, the insurance companies (and/or government programs) often end up paying expenses they shouldn't have to pay, which results in higher premiums for all policyholders or lost tax dollars. Fraud examiners, investigators, auditors, compliance personnel and analysts should note that medical facilities' financial records should show payments — or the lack thereof — of co-payments and/or deductibles. Patients might also have copies of receipts issued from medical facilities or perhaps even cancelled checks or credit card receipts showing what they paid. So keep in mind that it may also prove beneficial to interview patients plus current and former medical facility employees. It's been my experience that it's usually tactically smarter to try to interview former employees before interviewing current employees. Former employees don't have the fear of losing their jobs (livelihood) for telling the truth and are less likely to tell their former employers about the interviews. Keep in mind that a company's counsel might say that you can't legally approach and question those current or former employees. This provider scheme is similar to one often used in the auto repair industry. As you probably know, it costs more to get a car tuned-up then it does to change the air filter. But if an auto-repair business charges you for a tune-up but only changed the air filter, it's making money illegally. Listing an incorrect diagnosis or procedure is essentially the same thing. Unscrupulous providers can bill for extra services if they report false serious diagnoses or procedures performed. For example, if an elderly patient reportedly fell inside a nursing home, a crooked provider could intentionally misdiagnose her with head trauma requiring the (unnecessary) use of a computed tomography (CT) scan and/or blood tests. The sky's the limit for potential fraudulent provider claims with the elderly in poor health or patients with severe mental handicaps. Of course, some diagnoses require longer, more expensive hospital stays. I've studied numerous cases in which patients were often admitted for hospitalization, but they mysteriously "got better" as soon as their insurance coverage ran out. One of the most popular incorrect reporting of procedures is unbundling. In simple terms, unbundling is similar to going to a fast food restaurant and ordering a value meal — a burger, fries and soft drink for $5. However, when you look at your receipt, you find that the restaurant charged you separately for each item so that your total bill was $6.50. Obviously, the business makes more money by unbundling the package deal. This typically involves billing for services that aren't really necessary — like completing and billing for an unnecessary car tune-up. Unscrupulous providers use this scheme on hypochondriac patients. Tests and exams can go on indefinitely or at least as long as a patient still has coverage or is able to make payments. Alcohol and drug rehabilitation facilities are ripe for overutilization. According to the U.S. National Survey on Drug Use and Health "in 2011, 21.6 million persons aged 12 or older needed treatment for an illicit drug or alcohol use problem (8.4 percent of persons aged 12 or older). Of these, 2.3 million (0.9 percent of persons aged 12 or older and 10.8 percent of those who needed treatment) received treatment at a specialty facility." Obviously, there's a lot of potential for fraud in this area. Like all industries, the potential for corruption in the health care industry is great. Providers have been known to unlawfully pay for and/or receive payment for referrals. Obviously, that practice can lend itself to abuse when referrals are made for services that aren't even needed, such as X-rays, MRIs, prescription drugs, etc. To prove a bribery/kickback scheme, you must establish quid pro quo ("this for that"). Substantiating that the provider paid or received something of value in return for referrals is paramount and not very easy to do. Sometimes the kickbacks or bribes are hidden or disguised in the form of luxury vacations, discounts on facility rentals or hidden gifts as compared to just slipping a check or cash under the table. I investigated one provider who made inflated office rental payments to another physician to disguise his kickbacks for referring patients to him. Prescription drug abuse is sometimes defined as taking prescription medication (prescribed or not) for reasons beyond physicians' intentions. I first became aware of the severity and growth of this problem after reading " Under the Counter: The Diversion and Abuse of Controlled Prescription Drugs in the U.S.," a 214-page 2005 report prepared by the National Center on Addiction and Substance Abuse (CASA) at Columbia University. According to the report, the number of U.S. citizens who abuse controlled prescription drugs nearly doubled from 7.8 million to 15.1 million from 1992 to 2003. Painkillers are the most commonly abused prescription. These drugs' street value is almost 10 times the legal prescription value. Media around the country often report that thieves have robbed pharmacies at gunpoint to get painkillers. Crime prevention tips often suggest that homeowners should ensure visitors —especially children and teens — don't have unneeded access to the occupants' prescription drugs. The CASA report shows that reported overdoses are increasing. According to the CASA report, 28.4 percent of surveyed pharmacists reported that they didn't regularly validate the prescribing physicians' DEA numbers (assigned to them by the U.S. Drug Enforcement Administration, which permits them to prescribe drugs) before dispensing controlled drugs, and one in 10 pharmacists rarely or never did. I conducted an investigation in which a pharmacist stole large quantities of painkillers from his employer's inventory and then electronically submitted false claims to insurance companies using names of other beneficiaries' and their insurance policy numbers, which he obtained from his employer's computer. The pharmacist was smart enough to slip cash co-payments out of his own pocket into the cash register so there wouldn't be a financial shortage for his employer. To further avoid detection, he regularly submitted only a few claims for low quantity under each beneficiary's name. Submitting a claim for 1,000 painkillers under one patient's name in one day would have raised red flags. The insurance beneficiaries never even knew that the pharmacist had illegally used their names and insurance policies because most didn't receive explanation of benefit forms in the mail from their insurance companies for prescriptions filled under their names. None of the insurance beneficiaries lost any money in the scheme. When I confronted the pharmacist, he claimed he lifted weights daily and needed the painkillers for his soreness. (I could tell that he hadn't been lifting anything heavier than pill bottles.) If he had ingested all the painkillers he stole he would have been dead from an overdose. The investigation later proved that the pharmacist was selling the painkillers on the street for cash. Some acquaintances of the pharmacist said they paid him for the illegally obtained drugs. Claims can only be submitted, processed and paid when all of the required protected identifying information (PII) is listed on the claim forms. That PII will include the patient's: name (and beneficiary name if not the same as the patient), date of birth, insurance policy number and possibly Social Security number. PII is the key that opens the safe deposit box. Without it, no claim will be paid. Don't blindly assume that the "patients" whose names are listed on the claim forms actually received anything. A cautious fraudster may simply include a few low-dollar false billings on several different patient claim forms to stay under the radar: 200 false prescription claims at $50 each often will receive less scrutiny than one false claim for $10,000. So remember, don't dismiss small-dollar claims listed under individual patient names because they could be part of a higher-dollar fraud scheme. The names are still important data that you shouldn't overlook. A crooked pharmacist could also alter the quantity listed on legitimately received prescriptions for painkillers (or other drugs), manipulate the patients' paperwork and receipts or make co-payments like the above pharmacist and steal the extra drugs for himself. Possible schemes are endless. The health care profession is filled with honest, ethical, dedicated and committed individuals. However, like all industries, there are those who betray their colleagues and society. The scheme descriptions in this article will get you started in learning how to battle this scourge, help victims and reduce soaring health care costs. Charles Piper, CFE, CRT, is a private investigator, consultant and owner of Charles Piper's Professional Services in West Tennessee. Visit www.piper-pi.com. He can be reached at: pipercfe@cs.com. Good overview of the various different types of healthcare fraud. Charles, I have been around the health care fraud problem from a risk management and fraud controls perspective for 12 years. Your article is far and away the best in identifying some of the problems through story telling. People learn a lot from story telling and you master it. Kudos to you. I devote time to learning more about how environment shapes human behavior and how people affect judgments and make decisions. I think your bang on in explaining how your persons' of interest rationalize doing wrong. New science tells us people dont' make rational choices as once thought. People are predictably irrational (Ref: Dan Ariely 'et al'). People rationalize making bad choices when tempted between what they know is right and doing wrong.